Home > Mysteries > Space > Comet ISON 2013: What Really Happened? In case you missed it, there was some hullabaloo in the astronomy sector in 2013 around Comet ISON, but for those of us who are less astronomically inclined the reason for this excitement is often overlooked. Formally known as C/2012 S1 the Comet ISON could have made history by being the brightest comet that Earth has ever seen. Below we will take a look at the discovery of the comet, where it came from and what really happened. It is perhaps important to understand just what a comet is before going in to the particulars of ISON. A comet is defined by the scientific community as a celestial object which consists of a central nucleus composed of ice and dust. When close to the sun, these comets have what appear to be tails that are actually composed of dust and gas particles pointing away from the path of the comet. These tails result from the sun melting off some of the ice that comprises the comet. As this ice melts at extreme temperatures it eventually becomes gas that is pushed outward by the solar wind. When they are not seen close to the sun, these celestial bodies simply resemble large chunks of rock and ice. These chunks of matter are what are left over after the stars and planets were formed billions of years ago. Comets float in space in a cloud that is referred to by astronomers as an Oort Cloud. These comets are drawn out of the cloud by the gravity from celestial bodies that it passes. All movement and the direction of movement of a comet is determined by the stars and planets that it passes, most commonly this gravity in our solar system is a result of the sun’s pull. As a comet moves ever closer to the sun its tail becomes longer as a result of more ice evaporating. Comets will also accelerate the closer they get to the sun due to an increase in the pull of gravity. What is the Comet ISON? The Comet ISON was a relatively new discovery and although currently it appeared only as a spec on the radar, astrologists believed that it could have been the brightest comet seen to date. As the comet moved closer to the sun in 2012, astrologists said that it may have become as bright as the moon and be thus visible during daylight. The reason that comet ISON would appear to be so bright is that it is what researchers refer to as a “sungrazer”. Sungrazers are comets that get so close to the sun that they look as though they will actually graze against it. Why is it Called Comet ISON? Comet ISON is officially recognized as comet C/2012 S1 (ISON). ISON was named from the International Scientific Optical Network. When Was IT First Spotted? Comet ISON was first spotted by two amateur Russian astronomers, Vitaly Nevsky and Artyom Novichonok. The discovery was announced on September 24, 2012. The two spotted it on CCD images that they obtained on September 21 with a reflector of the International Scientific Optical Network near to Koslovodsk, Russia. When Was It Visible to the Naked Eye? Despite speculation the Comet ISON never became bright enough to be seen. As it came into orbit closer to the sun around November 28, 2013 it broke apart due to the extreme heat and other forces. It is reported by NASA however that a small fragment of it may have survived but the comet was completely gone by December 3, 2013. All of the fuss over ISON was due to the fact that this may be the brightest comet ever seen from Earth – we’re talking as bright as the moon. This type of comet is certainly a once in a lifetime occurrence. In fact, some say that the path of Comet ISON was eerily similar to that of one seen in 1680. This comet that was seen during the middle ages has been portrayed in drawings from both Europe and China and is portrayed with a tail that could be seen in daylight. This comet of 1680 is commonly referred to as C/1980 V1 or Kirch’s Comet. So technically we’re talking once in a lifetime only if someone lived 330 years give or take. What Was the Importance of Comet ISON? Aside from being the brightest comet that Earth has ever seen…or at least that the Earth could have ever seen in a few hundred years, Comet ISON was unique for another reason. According to researchers, the parabolic orbit indicated that it may have been a new comet that could have been drawn from the Oort Cloud. That means that Comet ISON although relatively a new baby in terms of comets, has been freshly plucked from the cloud that lays tens of thousands of AU from the sun. So what is so exciting about a new comet? Well, little is known about the Oort Cloud that lies so far from our planet and when new comets are plucked from it they can tell us quite a lot about one of the most mysterious sectors of our solar system. 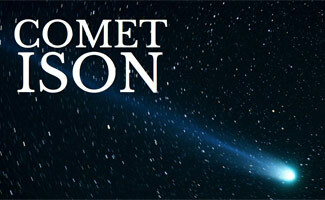 Is Comet ISON Related to the 1680 Comet? Although ISON is a new comet scientists are left to wonder if there is any significant link between it and the 1680 comet that it bears resemblance to. Some believe that in fact the two comets came from what was once a single piece of matter that was broken apart at a point in time. After being broken in to pieces this matter sat within the Oort Cloud until the smaller pieces were plucked from it and spotted as comets in the night sky. Watch this quick 14 second video to see the Comet ISON as it travels through orbit and is destroyed by the sun. Did you hear of and/or see Comet ISON?